Have you ever felt a "gap" in your life where things simply do not come together as you had hoped? Have these times been painful due to a loss in relationship or lack of success at work or with money, or being unaware of your life's purpose? "If you are looking to make a powerful change in your life that is meaningful and long lasting, then look no further! Patricia's Diorio's Circles are the place to be. Having just completed the four month course, I am astounded at the amount of information, knowledge and enlightenment that Patricia puts forth. Her work and delivery of her class is so complete that one cannot help but wake up to their true Self. I walk away from my Circle experience as an inspired individual with focus and direction for my life's true purpose. I carry with me a golden tool box of amazing life sustaining tools that Patricia so thoughtfully delivered, a collection of Tarot readings for reference to my personal roadmap, and new friendships built on vulnerability and trust. Patricia's Circle is a gift that should not be overlooked…a special gift that you give yourself." "Patricia Diorio's men's group introduced me to a new way of thinking, a new way of discovering what I want in my life, and a positive approach to decide upon the direction to take my life. Patricia's guidance helped me to clarify my vision of my relationships, my physical health, my financial health, and my soul's work. I learned about the scientific evidence to support the idea that our thinking can determine the actual cellular structure of our bodies. I discovered that I can design my life purposefully, and not simply be adrift, buffeted by forces around me..."
~Cliff Ghersen, Educator, Montecito, CA. "My reading with Patricia was mind blowing! I laughed and I cried. She saw me with incredible clarity and helped me look at the issues and people in my life in a new way. The brilliance and sensitivity of her reading was unlike anything I've experienced before with Tarot. I recommend her work to everyone." Now, you can participate without having to travel to Santa Barbara, California. Join me on line on Zoom.us for 16 weeks, starting Monday, May 14, 2018, at 5:00pm, meeting once a week for two hours. If you are interested hearing more about Circle, and meeting me before signing up, please join me on line for a Free Introduction on Monday, May 7, 2018, at 5:00pm PST. I will send you the Zoom link, when I hear from you via text or phone. Our journey through life is challenging. Few of us, if any, actually enjoy every minute of every day. We have fears, pains, defenses, subconscious programming that we developed at an early age that can ruin our enjoyment of life. There IS an easier way, although it takes personal dedication and practice to achieve the flow in life that you desire. I can help you find that peace and joy. As a spiritual coach and professional intuitive living in Santa Barbara, CA, the focus of my work is to assist people in embracing their true identity and power to achieve their heart's desires. After 20 years of this work, on my 70 birthday, a new book came to me called I Am The Word, a channeled text by Paul Selig. The authors identify themselves as Ascended Masters. I was immediately drawn to it because I was feeling that I had hit a plateau in my own spiritual life and was asking for the next level of awareness. This book was the answer. "Before I started Circle, I had pretty much retreated from life feeling there wasn't much left for me at the advanced age of 77. Now, through my work in Circle and with "I Am The Word, I have discovered a fresh outlook and a greater vision for my life." This book is rocking my world and deepening my knowing of myself in ways I can't quite articulate. Suffice it to say it's amazing, transformative and illuminating. 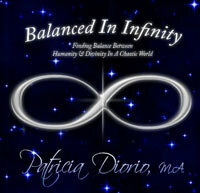 It's a gift to be participating in circle with Patricia and to be engaging the wisdom and guidance of this book." "This book is very powerful and moving. It offers a profound deepening of our spiritual awareness and connection to our Higher Selves and to our Guides. It's a life changer…"
If you are interested in truly deepening your spiritual awareness and achieving your heart's desire, and you are willing to dedicate time to practice, make the choice to join us. For all those who sign up, I am happy to give a free intuitive session with the Voyager Tarot which I use extensively in my counseling practice and in Circle. This would be a 15 minute phone session during which I will read your life cards, which are archetypes based on your birth sign and the numbers in your birthday. Knowing our personal life cards is powerful information for self understanding and enhancing awareness because they never change and can be applied to the practicalities of your daily life. Please join me for the Free Introduction on Monday, May 7th at 5:00pm PST. Or if you know that this work is for you, I invite you to sign up right now by clicking on one of the buttons below. Choose freedom and access to happiness on a daily basis. Choose your payment plan and join us on Monday, May 14, 2018. To sign up for the Free Introduction, please RSVP by text at the number below or you are welcome to call me. I'd love to talk with you directly by phone to share detail about my upcoming Circle covering the book and the associated journey you will experience, I Am the Word. It's a very personal and powerful investment of your energy, so it deserves answering your specific questions in advance. Simply sign up below and I will contact you to find a time and day that works for both of us to talk. Watch you email inbox for a response from me, Patricia Diorio. Download a PDF about Circle by clicking here.